Naval Sonar, NAVPERS 10884, 1953 was created a few years after WW II and incorporates the major invovations of WW II. It describes the peak of WW II US sonar technology with a hint of the comming Cold War innovations. This manual has a bit more math and theory than many of the operator manuals we have presented on this web site. If you are not familiar with the math, please do not be discouraged, instead try skipping what you do not understand and move on. The farther into the manual you go the less theory and the more practical systems are described. At the end, there are chapters that describe the most successful systems with very little math. Naval Sonar was prepared primarily as a text for a correspondence course for use in training Naval Reserve electronics officers. The aim in preparing this book has been to present a general over-all view of underwater sound principles and sonar equipment. Naval Sonar will serve as background information for officer personnel and advanced enlisted ratings who may be called upon to learn the details of installation, operation, and maintenance of sonar equipment. 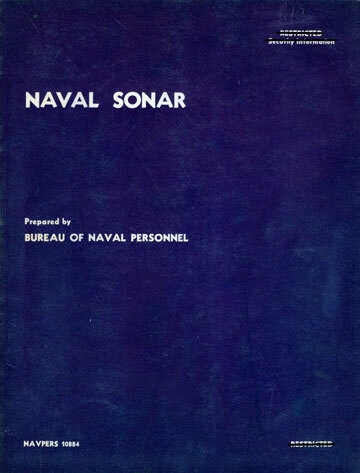 The summary technical report of Division 6, NDRC, volume 7, Principles of Underwater Sound, and various sonar manufacturers' instruction books were used as primary reference sources for Naval Sonar. This publication has been prepared by the U. S. Navy Training Publications Center for the Bureau of Naval Personnel. Figure 7-2. -Dual-channel receiver circuits. Figure 9-11 -Functional diagram, Mk 59 Mod 0. Figure 11-8 -Complete block diagram of the attack plotter. Figure 13-3 -Circuit of the JP-1 audio amplifier with line filter. Figure 13-15 -Schematic diagram of the supersonic-converter unit. Figure 13-17 -JAA triangulation-listening-ranging equipment. Figure 13-22 -Schematic diagram of the AN/UQC-1 equipment. Figure 14-3 -Over-all pictorial diagram of the WFA-1 equipment. Figure 15-6 -Schematic wiring diagram of the NJ-9 sounding equipment. Figure 16-10 -Model JM-4 radio sonobuoy equipment. Figure 17-3 -Schematic diagram of speed and direction controls of the attack teacher. Figure 17-5 -Schematic diagram of the receiver-amplifier and bear-ring-deviation indicator of the QFA-6. Figure 17-7 -Simplified functional diagram of AN/UQS-T1.